It was 32° C (90°F), sweat dripped between my shoulder blades while I stood still. But the warmth I felt was not coming from the desert heat, rather from the company I was in. I was surrounded by thousands of women wearing white who were clapping their hands in unison and leaning forward to hear every word the speakers were saying. Hope rose in waves around us. 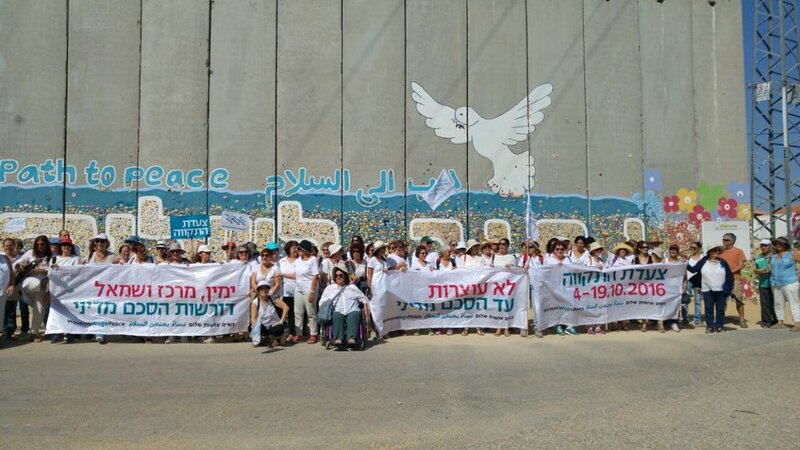 Women Wage Peace—the Israeli women’s peace movement that I researched for my masters degree—organized a massive event where for the last two weeks, women have been marching 250km from Rosh HaNikra, the northernmost point of the country next to the border with Lebanon, to Jerusalem. Along the way, they have stopped and met with different communities, and organized events and solidarity marches across the country. All along the way, people met the women and joined them. It culminated on Wednesday with thousands and thousands of people wearing white snaking their way through the streets of Jerusalem from the Supreme Court to the Prime Minister’s house. The organizers claim that it was a crowd of 20,000 people. The march was a year in the making. I remember sitting at a group discussion at a Kibbutz in the Negev last April the first time I heard the idea mentioned. Shoulders were shrugged: “Holding a march is a huge project”, some said. “During Sukot? By the Dead Sea? It will be too hot!” others said. “With Palestinian women? It’ll never happen.” Yet that didn’t deter the organizers and a year later a complex, multi-faceted event was taking place. Women Wage Peace (WWP) is an organization that was founded two years ago after the most recent war in Gaza. Women from around Israel began organizing around the belief that the cycle of violence must end. They officially emerged with their action the “Peace Train” in November 2014 where women rode the train from the North to the Southern city of Sderot to show solidarity with communities that had endured the heaviest attacks from Hamas’ rockets that summer. They organized a march to the Knesset in March 2015 to counter rhetoric of violence and demand a political solution. They organized 120 women to be standing with 120 placards addressing the 120 member of the Israeli Parliament on their first day in session. Their largest event to date, before the march, was their fifty-day fast in front of the Prime Minister’s house in Jerusalem corresponding to the one-year anniversary of Operation Protective Edge in Gaza. The organizers of the movement claim that women’s voices have worth and have been neglected in Israeli discussions of security up until now and that they must be included in the conversation regarding political resolutions. The group appeals to Israeli mainstream society by connecting women to each other based on the notion of communal female experiences overcoming political divides and emphasize the power of women to transform a dead-locked conflict into one that can be resolved. They emphasize again and again the need to reach all factions of Israeli society and underlie the belief that everyone wants the same thing: peace. However, they do not provide any details of what “Peace” is, they do not engage in divisive terms, they do not say the word “Occupation.” I originally held many reservations about this movement: in the context of political life here, organizations appear and disappear on the scene of conflict-resolution incredibly quickly. Personally, I had issues connecting with their a-politicism and vague promises, as I felt (and still feel) that everything here is political and it is best to name the evils we face in order to face them. And yet, in two years, they have amassed over 10,000 members from around the country. They have done the unimaginable: they have begun to reintroduce the concept of peace to Israeli society. This is a larger project then what may appear at first glance. Israeli society has increasingly become disenchanted, disengaged, and disinterested with anything having to do with “peace” since the collapse of the Oslo Accords and the Second Intifada in the early 2000s. For an in-depth reading and explanation, see Tamar Hermann’s book The Israeli Peace Movement: A Shattered Dream. Since then, a general malaise and penchant for maintaining the status quo has colored most political conversation. Security is the word of the day here, compared to the Palestinian realities that focuses on the Occupation (West Bank), or Blockade (Gaza). Violence is justified by claims to security needs for the Jewish Israeli populace within and without the official borders. Peace has turned into a dirty word within Israeli camps, and equally so in Palestinian camps. The peace of the Camp David Accords and the famed handshake on the White House lawn seemingly accomplished nothing for either side. Yet here is an organization, a movement, rallying around cries for Peace. Yet here we were, the morning of October 19th, 4,000 Israeli and Palestinian women walking 800m next to the Jordan River and the spot where Jesus supposedly was baptized. 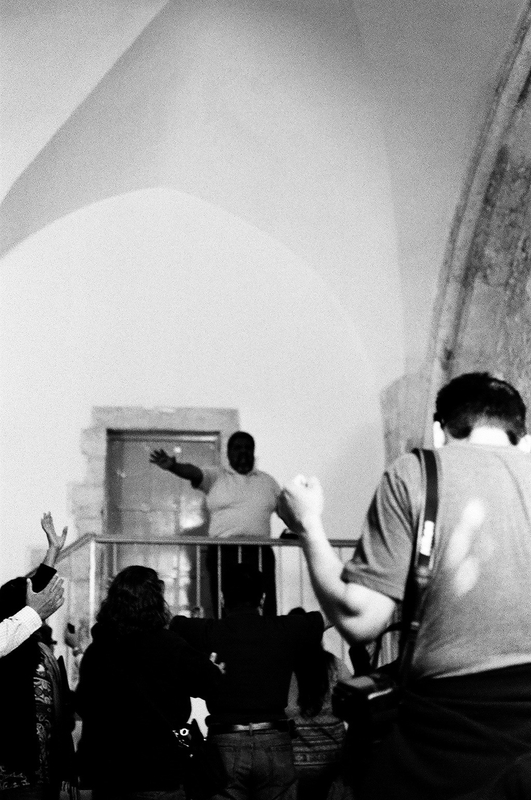 Yet here we were, 20,000 people walking the streets of Jerusalem that evening and the crowd was singing old peace songs from the days of past. Peace was the word of the day, hope was the word of the movement, and women were the ones leading it. Women Wage Peace had been busy since that meeting when the march was brought up over a year ago. The group began fundraising, organizing, and strategizing. They continued their “parlor-meetings” where women shared their experiences with war and discussed and debated what peace means to them. They continued creating spaces that encouraged women to be confident in their expertise, their voice, and their opinions. They unleashed a project called the “Israeli Salad” which was led by local community organizer Ya’aloma Zechut in the small periphery town of Ofakim, which focused on brining diverse voices from all sectors of Israeli society to the conversation. They became involved with an Israeli organization of lawyers called Itaah-Maaki (With You), which has been tasked with implementing a national action plan to implement the UN Resolution 1325 that focuses on the role of women in conflicts and in peace-building initiatives. WWP has been highlighted as the grassroots organization in touch with Israeli women and best able to undertake the project. They have also been hosting film-screenings across the country of the film Pray the Devil Back to Hell about the success of Liberian women’s peace movement that pressured their political leaders into ending their civil war. All of this work culminated in the two-week event which WWP dubbed the “March of Hope.” Beginning at Rosh Hanikra, a group of women began hiking the 250km to Jerusalem. The kick-off event included a moment when another Israeli women’s movement called the Four Mothers (Arba Emahot: known for increasing public awareness and pressure to evacuate Israeli forces from occupying South Lebanon in the late 1990s) passed off the literal torch to this new movement. Interestingly it also coincided with the women’s flotilla attempt to break the maritime blockade of Gaza (interesting piece comparing the women’s activism of the two groups here). Every day, while the women hiked from the North to the South, brandishing banners that read “We will not stop until [reaching] a political solution,” they sang a song written specifically for them and this week. Called “Prayer of the Mothers” and written by Israeli and Palestinian women: Yael Deckelbaum, Lubna Salame, and Miriam Tukan. Meanwhile, events were held around the country daily. Another woman from the community who is a part of the organization Kol Aher (Other Voice) spoke and then picked up the phone to call a friend of hers in Gaza. By holding the microphone to the speaker of the phone, we heard Maha’s voice as she shared with the crowd the realities of life in Gaza: the inconsistency of electricity, their fears, how it feels to be locked in a prison. As her voice cracked with desperation, barely pausing between sentences to breathe, Vivian Silver (an organizer with WWP) stood up from the crowd impromptu and grabbed the phone and spoke up. The next day we stumbled bleary eyed at 7am to the bus to head to the Dead Sea. The energy and the joy was contagious as we made our way through the south and picked up more and more women. We snaked through the highways, made our way to an old kibbutz founded in 1939, and were flagged down by ladies in white standing at junctions waiting to board. The bus filled up. We heard news that over 20 others buses were making their way to the meeting point at Qasr el-Yahud and that another 60 buses were expected to meet us in Jerusalem. Women from Eilat, Ashkelon, Ofakim, Afula, Beyt Shean, Kfar Saba, Umm al-Fahm, Tel Aviv, from the entire country were gathering. When we arrived at Qasr El-Yahud, there were buses as far as the eye could see. Women wearing white were disembarking to join the ever-growing crowd and were welcomed in Arabic, Hebrew, and English. “From Jenin! From Nablus! From Ramallah! From Eilat! From Tel Aviv! From Haifa! From Qalqilya!” shouted the organizers. "Welcome!" The choice of location was important: it is a pilgrimage site that is holy to the three monotheistic religions, but it is also located in Area C which means that both Palestinians from the West Bank and Israelis are permitted to be there. It is one of the rare spaces where a meeting like this can take place. The energy was palpable, and then Leymeh Gbowee mounted the stage. Gbowee is the Nobel Peace Prize Laureate and leader of the women’s peace movement in Liberia. She riled up the crowd and started with a chant: "When I say women, you say peace! When I say peace you say: Yes! When I say war, you say: No!" And we were off, marching down to the banks of the Jordan River. The scene was magical—thousands of women wearing white walking in the desert as far as the eye could see. Women wearing hijabs, women wearing high heels. Women carrying kids, older women carrying canes and portable chairs to sit on. Young women, teenagers snapping selfies. The event was a loud declaration that there are women from both sides who are willing to meet, to march, to stand together, and to find a solution. Leymah Gbowee spoke, the air was vibrating listening to her. Here stood someone who had accomplished the unimaginable, and here she was telling this crowd that they too could restore justice to their children's futures. We boarded the buses yet again, and took off for Jerusalem riding on waves of hope. The night was remarkable: the march ended at the street in front of Prime Minister Benjamin Netanyahu’s residence and speaker after speaker built up on the energy of the crowd. Two women who had marched the entire distance from the North spoke: one Jewish Israeli, one Palestinian Israeli. The Palestinian woman began in Arabic, and then remarked on what a powerful feeling that was to be able to speak in her own language here with this crowd. Hadassah Fruman, the widow of Rabbi Fruman, spoke alongside her daughter-in law Michal Fruman. The two live in the religious settlement of Tekoa and called on women to join the movement and push for peace and justice in the region. The symbolism of their speeches was clear: Michal Fruman was wounded while pregnant in a stabbing attack in 2015, and as she spoke, Hadassa held the tiny baby girl who had been born after that. Michal was the only one on the stage to say the word occupation. The Palestinian-Israeli mayor of Sakhnin spoke in tandem with the Jewish-Israeli mayor of the Eshkol region in the South. Huda Abuarquob, Palestinian regional director of ALLMEP (Alliance for Middle Eastern Peace), spoke with conviction and pride and said loud and clear to the crowd that it is time to put to rest the myth that there is no partner for peace. She emphasized that while this day was big, the real work starts tomorrow. Their work is not over. Since the march, the women are still sitting in a Suka in front of the Prime Minister’s house. They will march on October 31st to the Knesset to be there for the opening session and they have planned shifts of women to be present inside and outside of the Knesset during the upcoming winter session to put negotiations on the political agenda again. While the winter cold is starting to creep in, hope is keeping me warm. We were standing in the corner of Neve Ya’akov, a neighborhood that is often classified as just a suburb of Jerusalem, which lies across the green line and hugs the curve of the separation barrier. The distinguishing characteristic between the houses on the left and the houses on the right were striking. One side was clearly Jewish, Jerusalem stones turned yellow with time, white water-boilers speckling the rooftops. The apartments on the right were Arab, bright new stories built up to house more families, black water-boilers dotted their roofs. These areas are smack in the middle of East Jerusalem and called the “Ring Neighborhoods.” By international definition, they are considered settlements, however Israeli legal definitions do not agree. Most Jerusalemites would hear of these areas and consider them as just a normal suburb of Jerusalem. If you ask anyone living there, they will see a huge discrepancy between how they see themselves and how they see settlers who live across the wall in the West Bank/Occupied Territories. Most people living in these areas moved there for the economic benefits of living in Jerusalem, but slightly outside of the city center and the lower housing costs. Just like any story of suburbanization in any city. However, this is not just any city. This area is clearly demarcated on maps as being across the green line of the 1967 borders established after Israel’s military victory. Where we were standing was once Jordanian land. Off in the distance from a hilltop, we were able to even see the uncompleted construction of the King Hussein’s summer palace. The skeletal structure was left standing as a sort of strange tribute to the king. The surrounding Palestinian neighborhoods of Beit Hanina and Shu’afat technically reside under the municipal boundaries of Jerusalem, yet often the services that should be provided by the Jerusalem municipality are overlooked and the people who live there hold residential status in Israel, not citizenship. The Jerusalemites are only Jerusalemites--many of them hold Jordanian passports, or simply a travel document, or laissez-passer paper, from the Israeli government. Ir Amim, an organization that monitors the status of East Jerusalem, published a scathing report about the education system and how it is not meeting the needs of its Palestinian students (read here). For more information on the legal status of Palestinians in Jerusalem read here and Ir Amim’s report here. However, as our Professor was quick to point out, these simplifications between here/there, us/them are not clear-cut. While one may be quick to judge that Jews living in Jerusalem have an easier and better life, that’s not the always the case. These homes in Neve Ya’akov were built in the 1970s in order to house poor Jewish immigrants from central-Asia, and later Russians and Ethiopians after waves of immigration from the Soviet Union and Ethiopia in the 1990s. Called the Bucharim, these communities were not provided access to resources or aware of their rights by the state.They were given housing, and then more or less isolated and forgotten about in this corner. Out of sight, out of mind. Since then the neighborhood, which is connected to the larger Jewish area of Pisgat Ze’ev, has experienced many waves of transformation--mainly towards becoming a ultra-Orthodox Jewish neighborhood, like most areas outside of central West Jerusalem. These neighborhoods are under strict building permit restrictions, and it is almost impossible for the younger generations to afford an apartment near their families. However, while no new apartment complexes are being built, you can see a large new school and a brand new yeshiva (place for religious Jewish study). The neighborhood is keeping up with the needs of the religious community, and the growing families (who have an average of 8 children). The neighboring Palestinian neighborhoods of Shu’afat and Beit Hanina appeared to be much better off. This is noticeable from the road, again looking at the buildings, the homes of Beit Hanina were detailed: porches, porticos, arches, new glass windows that sparkled in the sunlight. These two neighborhoods are relatively rich compared to other Palestinian areas of Jerusalem. However, reality on the ground has shifted since then, especially since the wall separating Jerusalem from the West Bank was built. Residents of these neighborhoods in East Jerusalem are also under strict restrictions for building permits and the limbo that they live in impacts their everyday life. A friend of mine from Beit Hanina and I were driving down the road one day on our way towards Ramallah and Qalandia checkpoint and she pointed out the window and said, “That’s where my family’s house is.” And suddenly our view of the tiny cluster of homes and apartments and shops which had been right outside the window of the bus, was cut off by the gray, concrete wall. “We had to move to the apartment where we live now because they said that they were going to continue to build the wall right here and cut us out of Jerusalem.” Her family didn’t want to lose their status as Jerusalemites and be relegated to the chaos of the West Bank, so they began renting an apartment in an area that was clearly within the borders of the wall and Jerusalem. The wall hasn’t been finished being built, and her family can visit their house, but they can’t move back in their for the fear that is hanging over their head that their entire legal status could be thrown into the limbo the moment that the construction begins again. Since 2000, there is now a wall that snakes through Jerusalem and divides communities from one another. In some places, the wall stands 25 feet, or 8 meters tall, surrounded by barbed wire fences. At other locations, there is a fence. In yet other places, no barrier has yet been constructed, but by tracing dotted lines on maps, you can see the planned construction. “The real tragedy of all this,” our professor lamented, “is that the separation wall worked. It worked both to prevent suicide bombing and attacks, but there is also an entire generation that grew up separate from one another and never played football together or ran around through a neighborhood together.” This separation fortifies the demonization of the other. As we walked across the gravel in Neve Yaakov towards the wall, the sickly sweet smell of hot garbage in the nearby dumpster wafting towards us, we discussed the legal concept of proportionality. In discussing the construction of the barrier, there are two main things to keep in mind: the legitimate security concerns of Israel, and the human rights issues of the separation and continued occupation of the West Bank. The International Court of Justice ruled in 2005 that the construction of the wall was illegal as it violates humanitarian law, 14/15 judges. The one dissenting judge claimed that the truth of the security concerns of Israel was not adequately represented in the case nor discussed by the court. As more cases have been brought against the construction of the wall, including the case brought by the village Bil’in in 2007 which argued against the barrier because it would cut off the village from over 1,500 dunams of their land, these have been decided on a case-to-case basis of whether or not the construction of the barrier will harm the lives and human rights of those Palestinians whose villages and neighborhoods and lands will be divided versus the security gains to be made for Israeli society. We were trying to understand the sociological, political, and economic outcomes of the legal realities. As we were talking about these technicalities a man drove up to where we stood. He works for a company that maintains the wall, he is a Palestinian from Shu’afat. Our professor challenged us to lay aside politics and interpretations and describe what we saw. He asked us to try to understand the ways in which practical life creates demands that can be very separate from ideological sentiments. Someone living in one place or another may not be because they believe politically in the symbolism of living there. For example, a Jew living in one of these northern settlements in East Jerusalem or a Palestinian who chooses to live within the borders of Israel. Neither living situation can be simplified into just a political statement. The lines of Jerusalem are constantly blurred—even while there seem to be clear separations and divisions and worlds that are isolated from each other, there are always moments of overlap that surprise you. The moment that you think you’ve begun to begin to understand the situation and pack everything in nice, neat boxes and tie them up with a string, something comes along that unwraps everything. We ended our class standing on a hilltop of Pisgat Ze’ev. The sun was starting to set, the breeze was coming from the Judean desert, and music from a nearby synagogue and celebration of the arrival of a new Torah was drifting our way. Above our heads floated a surveillance balloon: a white tiny zeppelin with a camera attached. Our professor pointed out what it was surveilling, Shu’afat Refugee camp. And just like that, my heart sank. Shu'afat Refugee Camp in the distance to the right (in the shadow of the hill), new apartment in Pisgat Ze'ev in the foreground. Piles of apartments were packed into a valley and rose to the top of a hill. Trash was scattered everywhere, windows were broken, dogs were barking. Our professor told us about how this area was cut off completely by Jerusalem by the wall and by choice. Israel’s policy when building the wall clearly decided to not include the refugee camp in Jerusalem municipal boundaries, even though it is technically Jerusalem. The camp is known for terrible crime rates, and neither Israeli nor Palestinian police are willing to go inside. A friend of mine joined a group of activists on a tour for solidarity and wrote about it here, it is well worth the read. Our professor then pointed to the new apartment buildings in Pisgat Ze’ev that have been built whose windows face the refugee camp. These Jews will wake up and look out their window every day and see the tiny enclave encircled by the wall and suffocated by the situation here. The lack of housing in Jerusalem is so bad that people will choose to purchase a home in a settlement that overlooks a dilapidated refugee camp. If that’s not absurd, I don’t know what is. The organization Terrestrial Jerusalem keeps an eye on all the developments surrounding the use of land, exploitation of policies, and the expansion of settlements in East Jerusalem. Check out their site for good maps. For more information, or to join a tour of the Northern Jerusalem neighborhoods, see Ir Amim. They organize monthly tours. Jerusalem in the not so distant distance. Walking the paths of Lifta. We discussed the history of this area from the moment when the UN declared the proposed partition plan November 29, 1947 and the inter-communal war broke out between communities of Jews and Arabs who had been living in British Mandatory Palestine. Our professor led us to the preserved home of an Ashkenazi-Iraqi family named Yelin in the Motza valley and we learned the history of one of the first Jewish land purchases in the valley outside of the Old City of Jerusalem in 1860. Yellin and another Jew from Baghdad named Yehuda purchased the land from the neighboring Arab village Qalunya and set up a new Jewish community in the valley. From the upstairs porch, our professor pointed out the hill opposite from us, the terraced land, the clumps of prickly-pear bushes, and to a tumble of ruined walls. "There," he told us, "was where Qalunya was. A prosperous Arab village and neighbors to this new community. And that," he said pointing to the broken down walls, "was the summer home of the Grand Mufti Haj Amin al-Husseini." Sitting on this land now is a suburb of Jerusalem called Mevaseret. It's also the location of the new bridge which will be the new highway from Tel Aviv to Jerusalem. The construction for this project is massive, and our tour guide at the house shrugged her shoulders as she mentioned that this location was ideal for its springs, but they have since been blocked by all the dirt from the building of the bridge. As noted by our professor, the track for the train runs directly on the green line in some places, and beyond it in others. We discussed the relations between the two communities in the end of the 19th century and the beginning of the 20th century. Before the tensions broke forth after the Balfour Declaration in 1917, the rising pressure of Jewish immigration and the subsequent Arab revolts in 1929 and 1936-1939 respectively, and the White Paper in 1939, these two communities interacted daily. Either by sharing work and agricultural labor, nurses, nannies, using the same routes to travel, the Jewish and Arab communities overlapped and had close relations. According to the information video in the visitor's center, this all broke in 1929 as the riots reached the valley and several Jews from Motza were killed, including the entire Maklef family in the Jewish Moshav that was brutally murdered by some Arab villagers from Qalunya. Suddenly the neighbors were fearful and distrustful of one another. A new book is coming out by Hillel Cohen, an incredible Historian from Israel, which deals with this historical moment throughout the country: 1929: Year Zero of the Palestinian Israeli Conflict. As we climbed back in the bus to our next destination we began unpacking the questions about the importance of this location to the relations inside and outside the city. Why does a Jewish village outside of the walls of Jerusalem carry so much importance? Why was this the locus of battles in 1948 between the Hagana and the Palestinians? The corridor is the last point before Jerusalem and a valley surrounded by high hills. That means that strategically, there are many points to conquer and use to protect convoys that were using the old Roman road. The Jewish communities pre-1948 were mainly consolidated on a coastal strip in Tel Aviv and the surrounding areas and up to Haifa and the bay, the western plains, the Yizrael Valley, the north and east of the Galilee, within a few spiritual cities such as Tzfat and Tiberias, and within the Old City of Jerusalem. The Arab communities were the majority in the more hilly area of mandatory Palestine-- including all the central ridge of Judea and Samaria and central Galilee, the inner plans, and in the Negev (the Bedouins). For the Jews it was thus imperative that the corridor was kept open to bring supplies to the Jewish communities in the Old City. From the top of a hill nearby, we were able to see the view and began to understand the geo-political importance of this place. We then went to Lifta—a Palestinian village right outside the entrance to Jerusalem. When I say right outside, I mean right outside. A two minute walk down a pathway from where the main highway (Route 1) meets the Central Bus Station, we suddenly found ourselves in a disintegrating paradise. Right there on the hill under the highway is an entire old Palestinian village. This is exceptional as post-1948 most villages were completely destroyed and you can only notice their remains by the lingering cactus plants which dot the countryside or by impressive forests planted by the JNF. But Lifta is practically all still standing. Our Professor explained how this is due to its liminality: it is both inside Jerusalem and outside Jerusalem. Because of its amorphous location, it has been left untouched. Neither here nor there. We walked down a dirt path and arrived at a spring where an entire group of Haredi men were bathing in a intricately constructed basin which connected to a sophisticated system of water and aquifers. Nah-Nakh from Brasilov graffiti smiled down from the walls, and plastic Coca-Cola bottles and trash littered the area. We made a right turn down an intricate and sturdy cobblestone pathway and our professor led us to the village mosque, acknowledged the neighborhood oven where families would bake bread, and we sat underneath the shade of fig trees as he recounted the personal narrative of a Palestinian named Ya'akub who now lives in East Jerusalem and fled from the village with his family to Ramallah at age 8 in 1948. Ya'akub would describe Lifta as a paradise surrounded by fig trees, almond trees, pomegranate trees, carob trees, olive trees and a thriving agricultural industry. These were the seven species found in the Garden of Eden that are named in Jewish tradition. Lifta was not just a village, it practically owned most of contemporary central and north- central Jerusalem, all the way to Nablus gate and the French Hill. At that time Jerusalem was confined to within the Old City Walls, and the surrounding land was owned and rented out by Lifta. In 1946, 7,780 Muslim Arabs lived there, 756 Jews rented land and 20 Christians. There are sources which claim that this area was settled all the way back to the time of Canaanites (and or the Ancient Israelites, it depends on who tells the story), and the spring of the village is mentioned in Pharaonic texts. A 1553 census from the Ottoman Empire documents that 71 families lived in the village. It was a collective based community, and the heart of the village was the spring that we had already walked by. It served as a plaza for communal gatherings, women and children, and the elders. Decisions over how to divide the communal land (masha') were made while sitting under a mulberry tree next to the water. As the tensions rose in 1947, the Lechi-Stern group threw a grenade into the café of the village and 4 people died. Ya'akub's family fled to Ramallah. Residents from Lifta are now scattered around the world, but the community continues to nurture its bonds with centers in Jerusalem, Ramallah, Chicago, Amman, Zakra and Austin, Texas. If there is a wedding, there is no invitation—it's assumed that you'll be invited. If there's a funeral, everyone goes. No question. People come to this village today to sit in the abandoned buildings and look out across the incredible view or go swimming in the springs. Haredi Jewish men use the spring as a mikveh on Fridays to perform the ritual cleansing before Shabbat. Our security guard (who we were required by the university to have trailing behind us on the excursion) mentioned that Lifta is known for being a smoking spot for Haredim and Kahene extremists. There is graffiti everywhere, damage everywhere, marks of fires. The general disrepair is in such contrast to the intricate details of the stone arches, the thoughtful placement of paths, the lingering blue paint which shows how luxurious this home once was. In one building, the foundation stone in the doorway had been removed and it is just waiting to collapse. As the history of this valley sunk in, I couldn't help thinking how strange it felt to be walking through ruins of a community who is still living. Their ghosts seemed to haunt the high vaulted rooms. It's not like walking through a Roman amphitheater and feeling the immensity of an ancient empire. There are broken tiles on these floors that a living generation walked on not so long ago. And here I am crossing the threshold without an invitation by the true owner and I'm slapped in the face by the graffiti marking the walls which says "Death to Arabs" and "Lifta is revenging the Arabs." As we gathered on the bus to return to university, our professor challenged us. Both these locations carry a certain narrative, how do we take a step back to put it into historical context? My thoughts ran, but I couldn't find words to answer. The history is still unfolding around us daily, and the story of Motza and Lifta are not far enough removed to be stared at objectively. The schoolhouse of Lifta is surrounded by the shopping mall near the bus station which I see every time I take a bus back to Jerusalem from elsewhere. The red roof-tiles and old stones glare at the city which has developed around it. Jerusalem is city that is ever-evolving and never-forgetting.